Junior Ethan Myer performs songs from the Manhattan High Big Blue Marching Band’s set “Bluehemian Rhapsody” during the band concert on Nov. 29. It has been a big weekend for the instrumental music groups at Manhattan High, full of riveting performances and spontaneous cancellations. 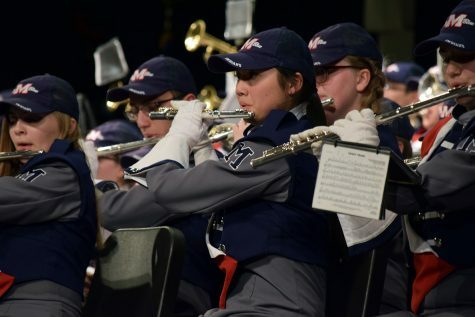 The Manhattan High Marching Band had the rhythm taken out of their steps for their performance on Nov. 30 when they took to Rezac Auditorium for a time spent inside rather than out of doors, preceding the orchestra’s cancellation at the Sunset Zoo. 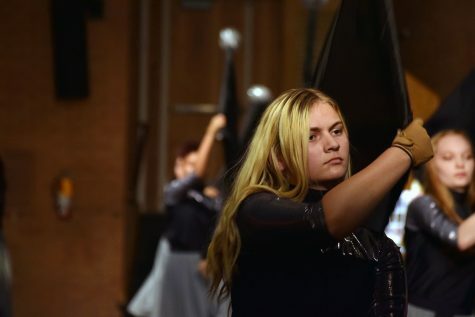 Senior Kayla Baumgartner performes with the Manhattan High School Colorguard during the marching band concert on Thursday. 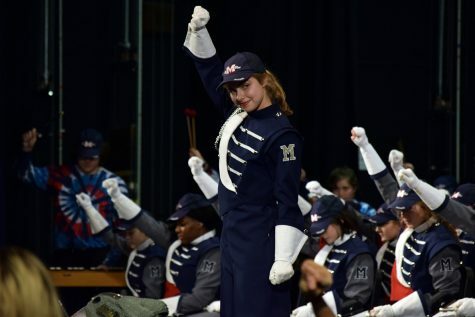 The concert featured both the Colorguard and the MHS Big Blue Marching Band together they performed band tunes, holiday music and their “Bluehemian Rhapsody” set. Along with a change in setting the group had to adjust their sound in order to accommodate the different volume levels and acoustics of being inside. According to Maggie Fontanini, junior, the band had to work with close quarters and a quieter sound. The band faced some additional issues when it came to performing inside besides volume. Being on stage was tightly spaced, which caused some discomfort to band members. Senior Tess Garvin raises her fist during the final seconds of the Manhattan High School Big Blue Marching Band’s concert on Nov. 29. 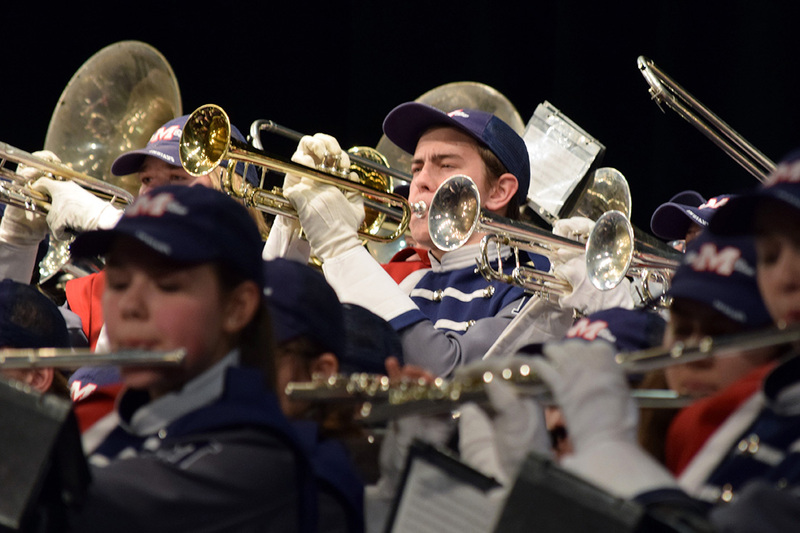 The concert featured the band’s “Bluehemian Rhapsody” set as well as classic holiday songs. 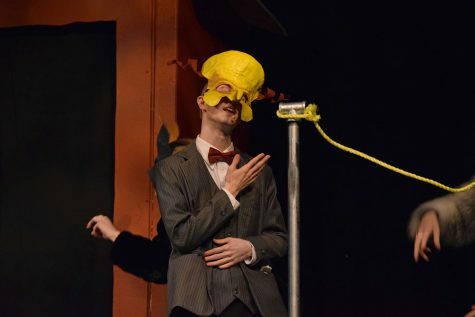 A raffle also took place at the performance to help raise money for the MHS music program. While the Marching Band practiced for their performance, the orchestra was struck with a case of bad luck when they were no longer able to play at their performance at Sunset Zoo. Director Nate McClendon told his students to “enjoy their Sunday” after reminding them that they weren’t going to play. Despite that setback, both groups are continuing to work towards their best sound through more practice, although the band didn’t get as much as they had hoped. The band had a portion of time reserved for rewards as well as a raffle fundraiser where the band sections created baskets as prizes. The group wasn’t entirely prepared for the concert, although they made it work despite having to fix certain aspects of their playing. They’re glad to have the opportunity to show their audience what they can do. Junior Mizuki Asano plays her flute during the band concert on Nov. 29. At the concert the Manhattan High School Big Blue Marching Band performed as well as the MHS Color Guard. Both groups rehersed for the performance, putting in the hours to prepare for the show.